by Sanford Levinson. New York: Oxford University Press 2012. 448 pp. Cloth $29.95. ISBN: 978-0-19-989075-0. Reviewed by Mark Rush, Dean, College of Arts and Sciences, American University of Sharjah. 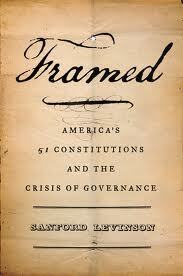 In Framed: America’s Fifty-One Constitutions and the Crisis of Governance, Sanford Levinson takes up where he left off at the end of his earlier book, America’s Undemocratic Constitution. Citing the nation’s ongoing inability to address vital political matters (particularly fiscal ones), he declares that the current constitutional system is woefully inadequate to address important policy concerns in the 21st-century. In the opening pages, he laments that we live in a time of national ungovernability and political dysfunction. In the end (chapters 16 and 17), he calls for a constitutional convention or, at least, for a great leader to rise up and lead us in the direction of political reform. In the limited confines of a solitary review, it is hard to offer a comprehensive commentary on all the analysis, history and food for thought that Levinson provides. He argues convincingly that there is no reason to regard the existing mechanisms, processes, structures and rules created by or set forth by the Constitution as immutable. If we begin with this assumption, then every aspect of the constitutional structure is fair game for reasonable, piercing, and discomforting inquiry and challenge. In Chapters 2 and 3, Levinson invites us to look carefully at the Constitution’s text, the purposes for which it was written, and the reasoning and processes that led to the choice of particular language and institutional design. While the document remains a revered part of the American political and cultural psyche, he reminds us that a commitment to constitutionalism and constitutional government does not necessarily commit a nation to a particular constitutional structure. This is particularly true if it appears that the governmental institutions created by the Constitution no longer serve the ends for which it was designed. So what are those ends? In an intriguing chapter (3: “What is the Point of Preambles? ), Levinson addresses this question. He takes us on a tour of constitutional preambles among the American states and across the globe to demonstrate that they range in specificity and length. Their purposes vary based on the nature of and divisions within the societies for which they are to be designed and, it seems, on the urgency of the setting in which a constitution is drafted. In the U.S., the preamble to the Constitution sets forth the point of the document: to “to form [or, at least, maintain] a more perfect Union, establish Justice, insure domestic Tranquility, provide for the common defense, promote the general Welfare, [*190] and secure the Blessings of Liberty.” Keeping this in mind, Levinson questions whether the institutions created by the Constitution still serve these purposes. Regardless of the preamble, Levinson shows that the actual wording and structure of the constitution were the products of intense and sometimes rancorous bargaining among factions and representatives that were not always of one mind. Bearing this in mind, Levinson suggests we should see the Constitution for what it is: a product of antique bargaining and compromise which should be looked at with the same critical eye, if not skepticism, with which we would assess any centuries-old document. One good manifestation of this politicized process is the original electoral college (which gave disproportionate power to the southern states by virtue of the 3/5 compromise). Its actual structure and function (requiring that states deliver their electoral votes as a block) was a response to the fact that John Adams defeated Thomas Jefferson thanks, in part, to the defection of a few electors in Virginia and North Carolina. Thus, while there is no shortage of criticism of the Electoral College today (because, as in 2000, it can produce a presidential “winner” who does not win the popular vote), it is hard to offer much justification for its endurance if, in fact, it was a product of political wrangling, and not an institution designed carefully to fulfill some guiding principle in the preamble. A key issue for Levinson is whether the Constitution is democratic enough, so to speak. To the extent that “We the people” ordained and established the constitution, the Preamble embodies a commitment to popular government. He therefore states that a “principal purpose” of the book is “to understand why proponents of republicanism and de facto proponents of democracy advocated the actual institutional structures that were adopted in 1787 and remains significantly unchanged more than two centuries later” (81). He provides the answer to the first question (why the founders adopted these institutions): they were the product of political bargaining and compromise. Why they remain in place (and whether they should be modified) is the focus of the rest of the book. Do we need a bicameral congress? Would a unicameral one not be better? What do we gain from a separate, unitary executive? Would a parliamentary system be better? Or, if not, why not give the executive the same sorts of powers that many U.S. state governors possess? What role should the courts – particularly the Supreme Court – play? Is the difficulty of the Amendment process a help or hindrance to our politics? There is no doubt that much has been learned about democratic institutions and constitutional government since the framing of the Constitution. Accordingly, to abide by the antiquated constraints imposed by the original constitutional structure while turning a blind eye towards what political science and legal scholarship have taught us is, at best, irresponsible and, at worst, consciously harmful to our politics. Framedis not simply a call for transformation to a parliamentary system or a call to look beyond our shores to the manner in which other nations conduct their politics. Instead, Levinson notes that many American states have constitutional institutions that differ markedly from those enshrined in the national Constitution. Thus, it is possible to look within our own nation (as well as outside of it) to find alternative constitutional and/or political structures which could lead to an improved (or, at least, different) politics. With so many different constitutional arrangements to learn from, there is no reason to regard the federal arrangements as sacrosanct or ideal. Instead, he suggests that we might benefit from a comparative assessment of the function of different institutions. But, while Levinson nicely diagnosis what ails American politics, he offers little in the way of a cure. What, indeed, is to be done to improve our politics? In chapters 16 and 17, Levinson contemplates two routes for constitutional reform. In chapter 16, he considers the possibility of a sort of Cincinnatus, George Washington or some other Caudillo who would appear on the American political scene and lead the nation in the attempt to revise constitutional structures and improve our politics. The great stumbling block, however, is the great effort required to amend the constitution. In the concluding chapter, Levinson addresses an alternative: a constitutional convention. He acknowledges that this prospect justifiably gives people pause. Once a convention is convened, there would be no way to control it. Perhaps the convention could be instructed to leave existing rights or particular lines of Supreme Court jurisprudence untouched. But, insofar as Levinson finds inspiration in the Founders’ decision to move beyond their original charge of repairing the Articles of Confederation in order to draft a new constitution, one must wonder why 21st century conventioneers would feel any compunction about moving beyond their charge. In asking this I offer no disrespect or gratuitous criticism for Levinson. In Framedhe has done a great service of demonstrating that the nation's institutions and processes are indeed antiquated. However, it is not clear is whether our current crisis of ungovernability is due to the quirks and characteristics of American political culture or the shortcomings of the political institutions created by the Constitution – or both. Would changing institutions improve our political attitudes and behavior? Recent polls indicate that the overwhelming majority of Americans express a great dissatisfaction with the overall performance of the government (Chapter 17). But, as the Arab Spring has shown us, expressing discontent is one thing. Developing a clear vision of how to reconceive the government is quite another. It is also unclear how we might improve our political culture so that, institutions and rules notwithstanding, the people will become more involved and politically engaged. Who would help us to develop a new civic philosophy or get our minds right? And how would this process of constitutional reform or of civic re-education begin? Again, this is not gratuitous criticism. Instead it is an acknowledgment that Levinson's argument has caused this reviewer to wonder how we would achieve the scope of political and constitutional change he desires without violence, civil war or circumstances so dire that they would dwarf the impact of the 9/11 bombings and the economic disaster that occurred in 2007. In sum, this is a fascinating book that is a must read for students of U.S. politics and constitutionalism in general. The Constitution remains a hallowed part of the nation’s political culture. Ideally, a constitution should transcend the travails of quotidian politics and serve, instead, as a set of parameters that reins politics in. But, having said that, it is important to be able to look at our (or any) Constitution and appreciate that it is, inevitably, a product of partisan bickering and compromise and that it (or at least parts of it) may have a limited shelf life or expiration date. One therefore wonders whether the product of a 21st century constitutional convention would be any more or less characterized by compromise, than our current one. Would we redefine marriage? Create a parliamentary system? Drawing upon the distinction he makes “between the Constitution as a means of settling basic questions or generating what may be endless, and often acrimonious, conversations about the meaning of disputable propositions” (p.112), one wonders whether a new constitution would do any better at settling questions effectively. Would gay marriage and medicinal marijuana be legal? Would the abortion battle have come to a quicker end (in either direction)? Would a unicameral legislature, a less federal system or a parliamentary national government be more apt to produce policies that Levinson (or those who agree or disagree with him) would like to see? Would our involvement in Vietnam or Iraq and Afghanistan have been different? Were we to change campaign spending laws, strengthen the political parties and implement a truly strong, whip-driven party system in Congress, would we see different policies? Would we have a more diverse Supreme Court? Would we reinterpret the Second Amendment? These are the sorts of political questions that cause one to pause when contemplating constitutional reform of the scope that Levinson suggests. I agree with Levinson that American politics does seem quite dysfunctional. But, I am not sure how I’d go about overhauling the constitutional system to improve our politics. Perhaps, as Jonathan Rauch (1999) suggests, we suffer from too much democracy. In this regard, changes to the rules governing politics might achieve some of the ends Levinson desires without requiring constitutional reform or revolution. This book will anger, aggravate and inspire readers who either disagree or find common ground with Levinson. He has made a great case, at least, for constitutional introspection and, at most for full-fledged constitutional reform. Scholars and students will learn a lot (about the constitution and critical thinking) from Framed. It’s a great work that deserves a place on any scholar’s bookshelf. Rauch, Jonathan. 1999. Government’s End: Why Washington Stopped Working. Public Affairs. Copyright 2013 by the Author, Mark Rush.